Hotel Carlo is strategically located for those who want to combine relaxation with a bit of culture could also easily reach Ascoli Piceno "city of hundred towers", Offida town renowned for its precious lace and famous for its Acquaviva castle and its fortress. Forthose who wish to to spend their holidays at sea , about 10 km away from San Benedetto del Tronto , thepalm trees and pearl of the Adriatic coast with its white sandy beaches. Ascoli Piceno every 3rd Sunday of the month: Market 's Antiques. Ascoli Piceno main town, one of the five provinces of Marche, is a rich and varied anthology of art: every century, every style has left its indelible imprint in the travertine, the typical local stone, which have served the Roman builders, medieval, Renaissance and Baroque. 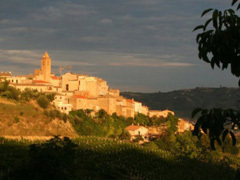 Nestling between the river and the river Tronto Castellano is one of the most beautiful small towns of Italy. We can admire the monumental Piazza del Popolo (XV - XVI sec.) surrounded by colonnades, the Palace of the Captains of the People (XIII sec., remodeled in 1520 by dell'Amatrice Cola) and the wonderful apse of Saint Francis (Roman - Gothic cloister and elegant Loggia dei Mercanti dated 1513). Arringo Square, named after the popular assemblies that were held there, is bounded by City Hall where you will find the Pinacoteca Civica, which includes famous paintings of C. Crivelli, P. Alemanno, dell'Amatrice Cola, Titian, in addition to the valuable cope thirteenth of Nicholas IV. Arringo other side of the Piazza: the Cathedral of St. Emidio of Trier, which stands on the remains of Roman structures and preserves valuable works, including a splendid altarpiece C. Crivelli. In the crypt is a Roman sarcophagus with the relics of the saint. We pass by the many historical attractions - art and the Romanesque churches, the soaring towers carved travertine, to charming views overlooking the Mount of the Ascension on the one hand and the group of the Monti Sibillini other. Finally, it is rich in local handicrafts with the production of ceramics that has wine and food wines doc Rosso Piceno, Ascoli white Falerio packages and delicious stuffed olives: green olives stuffed keep, stuffed with a filling of meat. Ascoli Piceno every 3rd Sunday of the month: Market of 'Moving on the Adriatic coast, just 10 km away from San Benedetto del Tronto, a modern city is linked to the sea for economic development for the tourism industry, being an important seaside destination. 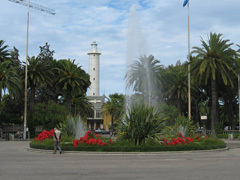 The Port and Fish Market are among the most important in Italy. It 'called the "Riviera" thanks to the promenade of palms which stretches for about ten kilometers along a beach of fine sand. 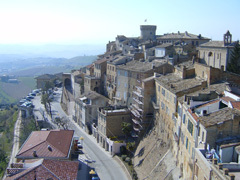 On top of an outcrop of tufa is Offida, city blaze of red brick with villages made of clay, poor in clay walled forms of hot colors, moods, art. Roman city, and then the Lombards, was settled by Benedictine monks of Farfa who made it rich and bright. At the end of the fifteenth century. was built the new fortress, quadrangular fortress armed with two round towers. In the monumental Piazza Vittorio Emanuele II, we find the Renaissance Town Hall with the Library and the Archaeological Museum. 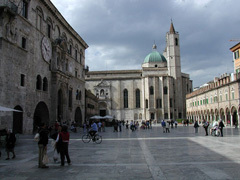 On the left side of the square are the "Church of the Immaculate Conception" and the "Church of Suffrage. " Finally, the Shrine of St. Augustine, imposing brick church began in 1338 and completed in 1441. Offida is also known for the ancient craft of bobbin lace, delicate lace that are created with a thread, a pincushion and fifteen thin bearing spindles handled simultaneously. The women of Offida bobbin lace as early as 1400. One of the ways that lead to Offida called the "Strada del Rosso Piceno Superiore ". 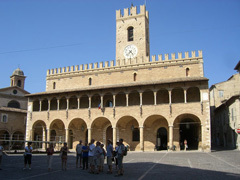 In fact, the town of Ascoli, is at the center of a small area of production of this type of wine that is similar, but different, than the more common Rosso Piceno. One aspect that makes you understand what Offida is renowned for its wines enough to accommodate each year in early September, a major exhibition of the wine market, "Of Wine Wine", now in its sixteenth edition. Among the Reds, as well as Rosso Piceno Superiore, the quality is of particular Offida Red, while among the whites, together with the Ascoli Falerio of packages are produced by the Pecorino and Passerina vines. La Rocca di Acquaviva was built in medieval times to the wishes of family Acquaviva of Atri. The fortress, which has always been enthroned on the beautiful town has a beautiful tower shoe, and is considered one of the most interesting castles in the Marches. His system is indeed unique, with the curtain leaning against the ramparts trapezoidal cylindrical tower and the tower on a pentagonal plan with a deep escarpment. The archaeological excavations carried out in 1880 near the castle of Spinetoli, brought to light residues of hearths, pottery, weapons, utensils belonging to a group of prehistoric dwellings. Subsequent excavations of a necropolis did emerge VII - V sec. BC. In the Roman there was housed a shrine dedicated to Goddess Tellure. The reinventing of tombs shows that, where today stands Spinetoli, there was an ancient Roman alley. 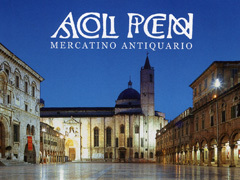 The country is mentioned in a donation of 984 to the Bishop of Ascoli, and later was linked to the events of the same municipality. Remember the Shrine of Our Lady of Grace (1759), built on a preexisting shrine that contained a painting on tufa which still are attributed healing powers.